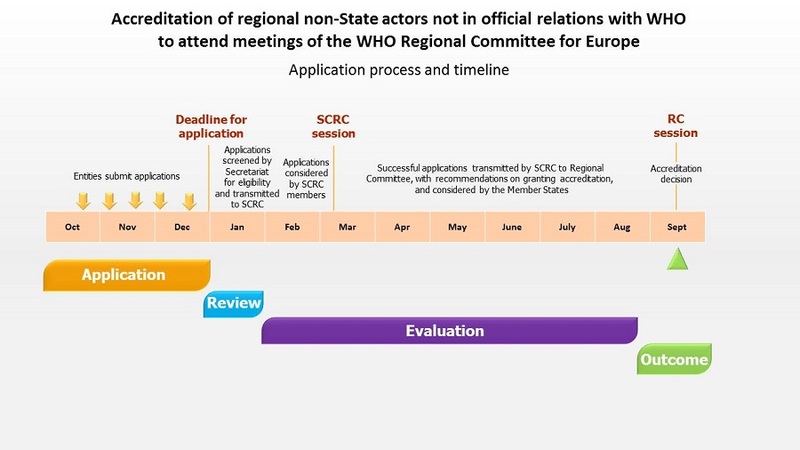 Accreditation is a privilege that the WHO Regional Committee for Europe may grant to regional nongovernmental organizations, international business associations and philanthropic foundations. It includes an invitation to participate, without the right to vote, in meetings of the Regional Committee and the possibility to submit written and/or oral statements through WHO Europe. The procedure is in line with article 57 of the WHO Framework of Engagement with Non-State Actors (FENSA, Resolution WHA69.10) and was endorsed by the 67th WHO Regional Committee for Europe (Document EUR/RC67/17 Rev.1 and Resolution EUR/RC67/R7 on “Partnerships for health in the WHO European Region”). The aims and purposes of the applicant entity should be consistent with the WHO Constitution and in conformity with the policies of the Organization. The applicant entity should be actively engaged with WHO Europe. Membership and/or activities of the applicant entity should be at the regional level. The applicant entity should be non-profit in nature and in its activities and advocacy. The applicant entity should have an established structure, a constitutive act and accountability mechanisms. The applicant entity, if a membership organization, should have the authority to speak for its members and have a representative structure. All applications for accreditation must be submitted to WHO Europe by email to the following email address: europar@who.int. the entity’s acknowledgment of understanding and agreement that the provided information will be made public via the WHO Register of non-State actors. The entities might also be requested to enter information in the Register themselves. Incomplete or unclear information could lead to rejection of the application. By 31 December: Applications must be submitted to WHO Europe. The Secretariat reviews the applications to ensure that the established requirements are fulfilled and prepares a report for the Standing Committee of the Regional Committee (SCRC). March: Based on the report of the Secretariat, the Standing Committee provides recommendations and a draft decision on granting applications for consideration by the Regional Committee (RC). September: The Regional Committee considers, amends when necessary and adopts the draft decision. The Regional Committee’s accreditation decision will be included in the Report of the Regional Committee, and the Regional Director will inform each entity of the Regional Committee’s decision on its application. The accreditation status will be reflected in the WHO Register of non-State actors. The Regional Committee reviews collaboration with each accredited non-State actor every 3 years and decides on whether to maintain the accreditation status or to defer the decision on the review to the following year. Accredited entities must provide a report on collaboration with WHO Europe through the Secretariat every 3 years, by the end of December. The report will be published in the WHO Register of non-State actors. In line with FENSA articles 65 and 66, the Regional Director can also propose an earlier review based on experience of the collaboration with the entity concerned (in case of issues such as non-fulfilment of the entity’s part in the plan of collaboration, lack of contact, failure by the entity to fulfil its reporting requirements or changes in the nature or activities of the entity concerned, the entity ceasing to fulfil the criteria for admission, or any potential new risks for the collaboration). The Regional Committee may discontinue accreditation if it considers that such relations are no longer appropriate or necessary in the light of changing programmes or other circumstances. Similarly, the Regional Committee may suspend or discontinue accreditation if an entity no longer meets the criteria that applied at the time of granting the accreditation, fails to update its information, or fails to fulfil its part in the agreed programme of collaboration or to report on the collaboration.